Sally's going back to her roots. 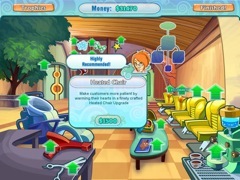 Join everyone's favorite esthetician for a trip down memory lane in Sally's Quick Clips, an exciting new challenge featuring game play never before seen in any previous Sally game. Sally's come a long way in her efforts to beautify the world. From her first salon to her latest spa, Sally's made each of her clients more beautiful and confident than ever. While reflecting on her years of success, Sally's mind drifts back to her humble beginnings when, fresh out of beauty school, she jumped at the chance to appear on the hit TV Show "Styling America" and a chance to win $100,000! Arrange scissors, dryers, hair color and more into matching groups of three or more to gather resources for the special services you'll provide to your choosy clients. 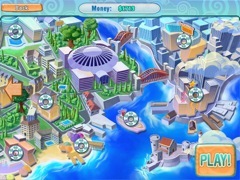 Match your customers' tastes and make them look sharp in fun mini-games. Enhance your supplies with all-new upgrades and use special power-ups to give yourself a winning edge. And calm your cranky customers with hot tea, magazines, and more. With your help, Sally's sure to win the big prize on this dazzling TV competition! Millions of players around the world have loved following Sally on her amazing adventures and helping her get to the top of her game. Now, see how it all started with Sally's Quick Clips, an original prequel.